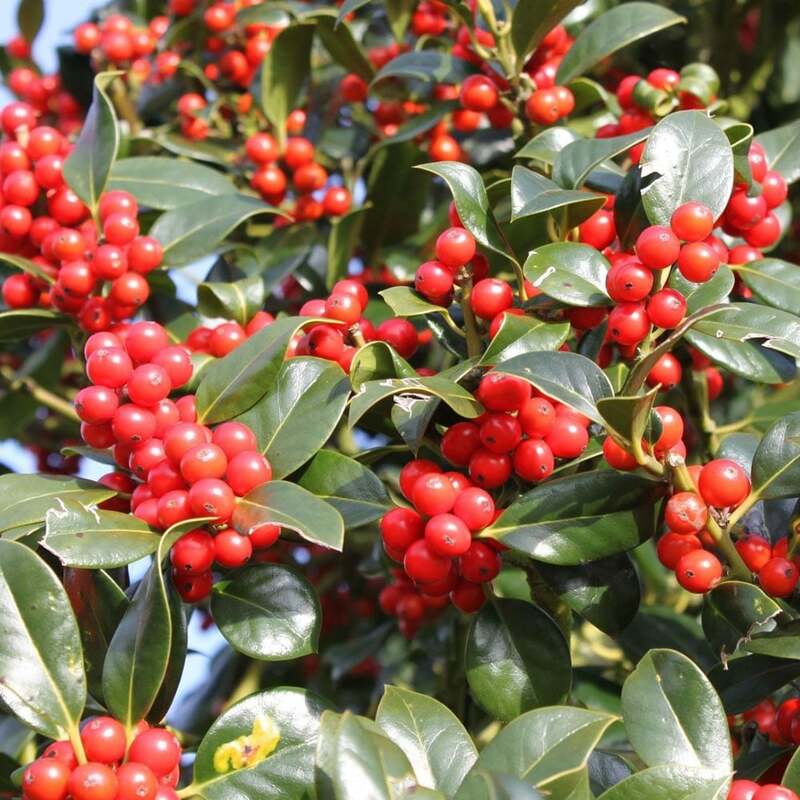 Characteristics: Evergreen tree or shrub with dark green foliage and bright red berries in autumn and winter. Flowering: White flowers in May to June. Height and Spread in 20 years: 6m / 4m. Tree or shrub habit. Hardiness and Best Position: Fully hardy. Full sun or partial shade. Soil: Moist, well-drained, moderately fertile, humus-rich soil. If you are looking for an eye-catching focal point in a garden, Holly always makes a great choice. It is easy to maintain and can be grown into a tree or trimmed back as a smaller shrub. The Ilex aquifolium J.C.van Tol offers spineless, glossy dark-green foliage on dark purple stems, an imposing colour scheme that will delight the eye. It is a female plant, but unlike other female Hollies, it is self-pollinating and will burst with bright red berries in autumn through winter. In May and June it offers lovely white flowers, adding to the all-year round interest. Holly plants make great festive decorations to put on the table as a centre-piece when the family gather round to celebrate the Christmas spirit. Pick your Holly for celebrations in early winter when the branches are loaded with deep red contrasting berries and the birds have not yet got to them! This English Holly is fully hardy and will thrive in full fun or partial shade. It prefers moist, well-drained, moderately fertile, humus-rich soil. The Holly needs minimal pruning. Remove any diseased or wrongly placed branches in spring and trim back holly hedges in late summer. This is a delightful choice for a small garden and can be planted as a statement piece or can be used as a screen or hedging. The red berries attract birds into your garden, adding movement and sound in winter when other plants are bare and uninteresting. Mix and match with the magnificent Ilex aquifolium 'Argentea Marginata' to create a truly festive look.